Chrome nails are on the rage these days and i cant have enough of them. Though i haven't posted much about them here but i am continuously testing different brand mirror powders and today's post is featuring my favorite mirror powders in my collection. 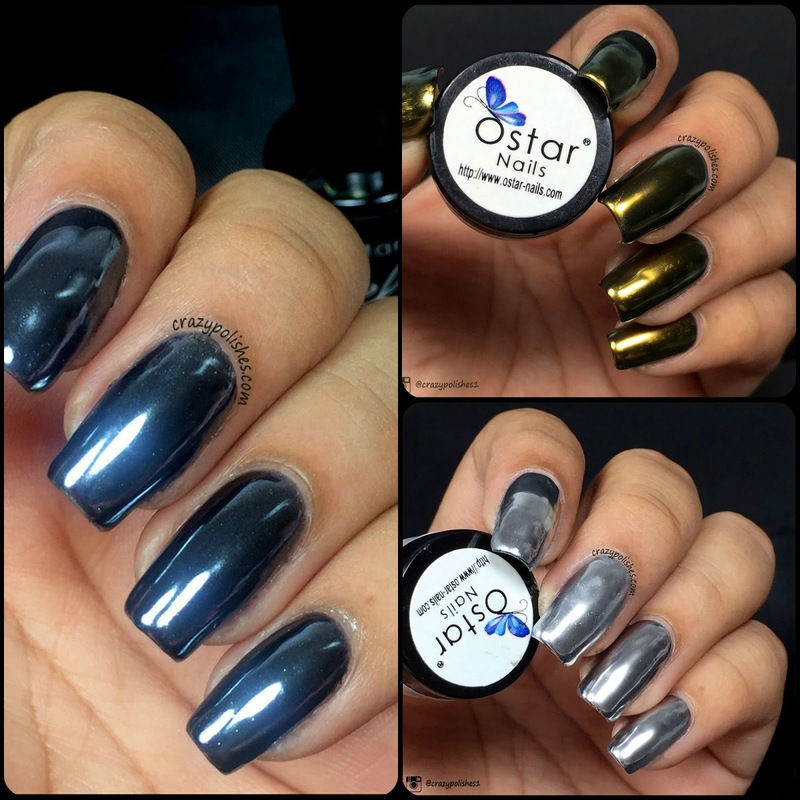 Ostar Nails is a Taiwan based company. They released variety of powders like holographic powders, multi chrome mirror powders, gold, silver mirror powders. I have reviewed both of their holographic powders previously(check HERE), today's post showing three of their chrome mirror powders which also come as a set "Mirror Snow Powder Kit". What is a Mirror/Chrome Powder? Chrome/Mirror Powder is a very fine powder which comes in variety of options like silver, gold, multichrome and even holographic. The specialty of this powder is, when applied over a gel base it gives mirror-like chrome look. The effect is unmatch-able to any other chrome finish polish or foil or anything like that available currently in market. These gives flawless finish and super reflective effect. The only downside is that these powders works perfectly with gel only products. Won't this powder work with regular nail polish? Primarily mirror powders are made to use with only gel polishes and works only on a no-wipe gel top coat applied before applying the powder. Some bloggers/vloggers did test them with regular polish and water based top coat and got good result, i however don't suggest it for two reasons, first the effect isn't as strong as gel application, second the powder might not last long(maybe 2-3 days)as the regular top coat isn't as strong as gel top coat, and if you are a cook like me, it may get into your food. Its just my point of view, its totally up-to you if you wanna try them with regular polish and top coat. Just keep in mind that you will need a water based top coat(like what we use for nail foils, piCture pOlish revolution and little ondine are few of those that works). Coming towards today's post Ostar Nails Mirror Snow Kit has 3 different mirror powders, one mirror base coat, one mirror top coat and a swarovski silicon brush. the powders included in kit are Snow Silver, Diamond Gold and Dark Silver. I have posted a "how-to" video for all of these powders on my Youtube channel. All the three powders works amazing and give very nice finish. They apply nicely too and need a very tiny amount to cover whole nail. Snow Silver is a silver mirror effect powder. Diamond Gold is my favorite among these three powders. It is so beautiful and gives such a flawless finish. Dark Silver gives a darker mirror finish. It look dark grey upon applying on a black gel base. I need to try it on a colorful base to check how will it look on that(i have a feeling that it will make colorful chrome nails but i am not sure, instructions suggests to apply it on a black base only). Do check out my Video to see how to apply these powders. The kit sells for $65 +$11(shipping)and you will get full size miror top and base coat alongwith the silicon applicator and pots of above three powders 1gm each. All of these products can be buy individually too. Hope you like this review. If you have any question regarding these, please leave a comment.